ATTRACT MORE GAME TO THE KILL ZONE. Our special wicks absorb scent better than any other wick on the market. Wicks dry out fast. And that’s a problem when you can’t rely on your wick to disperse scent the entire time you are hunting. Our wicks don’t dry out because of the ScentBlasterTM wicking system. ScentblasterTM produces scent 25x longer than other methods. Stay in your blind longer. 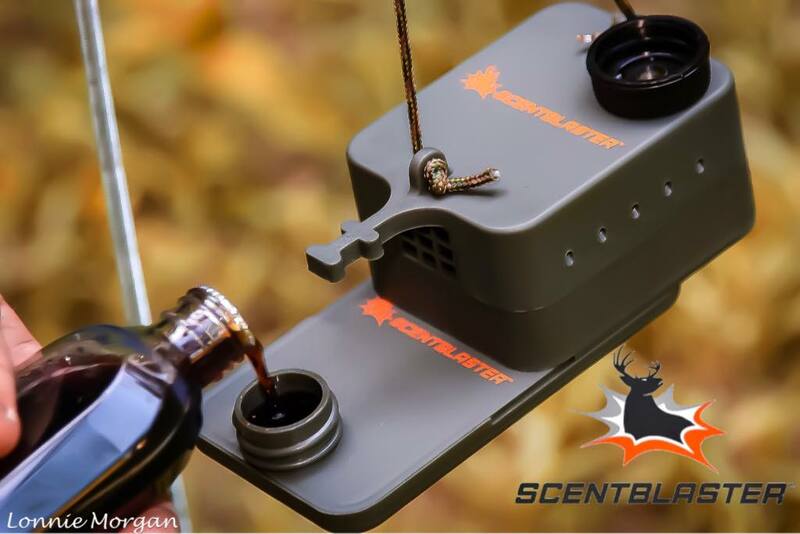 You can rely on Scentblaster to produce scent for your entire hunt without having to get out and re-soak the wick. Our scent doesn’t decline in the first 7 days. 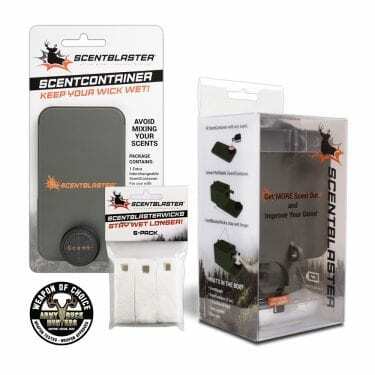 ScentblasterTM gets more scent out. Period. Attract more game into the kill zone, giving you more looks during your hunt. A small fan blows the scent into the air to travel much farther than just hanging a wick in a tree. The wick is basically sitting in a bottle of scent. Introducing the world’s best wicking system for hunters. Our wicks are super-absorbent. As the wick sits inside of the scent container (which acts like your scent bottle), the scent travels ALL the way up to the top. On days with no wind, simply turn on the battery-operated fan, and let it blow air across your wet wick and disperse the scent up to 1500 feet! This is our quiet blower fan that you can use on any day, but is most useful on calm days with no wind. This is the scent container - or 'reservoir'. It can hold a full bottle of your favorite scent! The container simply slides on and off the main housing, allowing you to easily swap out different scents. To store your scents, put on our leak-proof cap and label as needed. No more lost caps for your scent containers! Use our special designated area on the top of the unit to store your magnetic cap while in use. A strong magnet holds your cap in place even in windy conditions! These ventilation holes act as the air intake for the fan/motor unit, drilled at 30 degrees to prevent rainwater from entering the unit. We thought of every detail in the engineering and design of ScentBlaster! These two tabs are how you attach the lanyard to the unit, so that you can hang ScentBlaster in a tree! All kits come with the hanging lanyard. This turns the fan on or off. Powered by 4 AA batteries, you can expect 60+ hours of run time on the fan. Removable ScentContainer holds a standard bottle (2 oz) of your favorite attractant or cover scent. Scent has absorbed halfway up our super absorbent wick after only 15 seconds in the ScentContainer. Scent has absorbed to the top of the super absorbent wick in just 30 seconds in the ScentContainer. Still absorbing scent after 45 seconds in the ScentContainer. After 60 seconds, the ScentBlasterWick is fully saturated. No more dried out wicks! Experience the ScentBlaster difference and attract more game to the Kill Zone! After 16 hours, the wick is still wet and fully saturated! Traditional wicks have dried out in a few hours. Switch to ScentBlaster and attract more game to the Kill Zone. 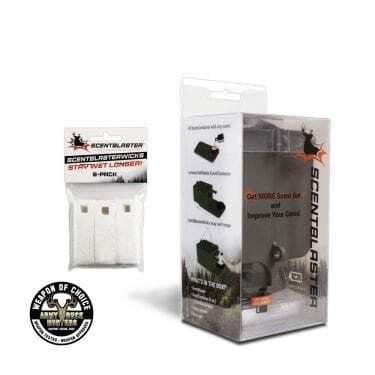 Switch to ScentBlaster and attract more game to the Kill Zone! Featured Products – Order Today! Great product was skeptical at first but results have proven the success. The best way to disperse your favorite scent and lure. Awesome product to cover your area with your favorite scent, works wonderful with Red Arrow Scents! Thanks for one awesome product! This product has changed the bar on scent dispensers. Great Products, Great People, Great Success......Get Yours Today! ScentBlaster works great with your trail cams. Stop pouring your scents into the ground or using corn bait! Big boar drawn in with ScentBlaster and Red Arrow Scents Killer Korn. Congrats! Northern Georgia bears attracted to ScentBlaster and J&S Scents. First bow kill using ScentBlaster and Apparition Scents Nightmare Pre-Orbital. Congratulations! Trophy Oklahoma buck using ScentBlaster. Congratulations! Hunting buds score two Oklahoma bruiser bucks using ScentBlaster. Congrats guys! Wayne's largest buck taken bowhunting using ScentBlaster with vanilla. Congrats!